In the same week that Sofia wins the “Best Bulgarian City to Live In” award, Vitosha Mountain Natural Park celebrates its 75th birthday. The mountain, an extinct volcano sited at the southern edge of the capital, is popular all year round with local and visiting walkers and climbers alike. 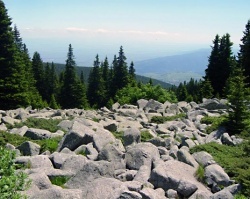 Vitosha is designated a European Natura 2000 sited. The protected natural habitat is home to bears, wolves, wild cats and chamois, and several species of rare plants. A long-running battle between developers and conservationists is, for now, on hold. In recent weeks, as reported by Novinite.com, Bulgaria’s Minister of Environment and Waters, Nona Karadzhova, annulled a previous official decision that would have allowed massive development of the Aleko ski zone. The developer, Vitosha Ski AD, proposed the construction of 8 new ski runs served by 18 new lifts, and to increase the area of ski slopes from the present 19 hectares to 142. Conservationists in Bulgaria and abroad claim the blocking of the project as a partial success. Much illegal damage has already been inflicted on the area. Trees that are state property have been cut, and many of the geologically important moraines have been blown up. The entire issue of the development of Vitosha Mountain has been clouded with allegations of mismanagement, corruption and illegal conduct. All this has not gone unnoticed by organizations such as the World Wildlife Fund and the GeoReporters web site. Both have published articles commenting on this ongoing battle, supporting the campaigning work of the “For the Nature” group of more than 20 conservation organizations.